We know that lately, we've only been writing about teams with "New Jersey" in their names when they do something historically bad, so to balance this out, we come today to give credit to Devils goalie Martin Brodeur, who last night accomplished something historically great. With a 3-0 victory over Buffalo, Brodeur earned his 103rd career shutout, tying Terry Sawchuck for the most of all time. Trust us, as a Rangers fan, we write this begrudgingly. We tried really hard to write off (in our mind at least) his career-wins record (575 and counting) as a product of a perpetually good New Jersey defensive system and the fact that wins records were tainted by the introduction of the shoot-out. But this record, assuming he notches one more shutout, is pretty legit; it's probably made more impressive by the existence of wide-open, four-on-four overtimes. For good measure, he's also five appearances away from breaking Patrick Roy's record of 1,029 games played by a goalie. The Devils next play tomorrow night against Carolina. We're sure Brodeur will be in goal, because he's always in goal. 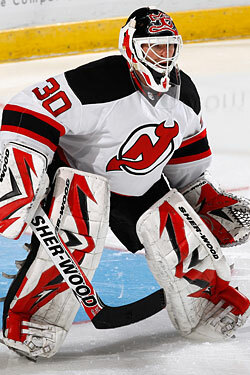 (Being the Devils backup goalie in 2009 is sort of like being the Orioles backup shortstop in 1993. It's an easy way to make a living.) Just so you know, the Hurricanes have been shut out four times this season — once by Brodeur. So congrats, Marty. We'd offer to shake your hand, but we know you're not really into that.